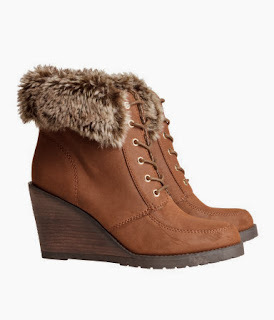 I ordered these ankle wedges/boots with fur and I have to admit I was kinda let down when I saw the shoes. I expected brown shoes, but I got khaki or grayish instead. They're really warm comfy, quite warm and quite high. But the color is very different than the picture. They're not as tacky as I thought, so that's a relief. Though it depends how you combine the boots. And I'm keeping them, but I did send a message to the customers service. You might wonder why I'm keeping them while I don't like the color. It's not that I hate or something. I think the wedges are cute and I wouldn't mind the color if that's what I planned on buying. But I ordered brown ones. So yeah, I'm slightly disappointed with the H & M at the moment. But it will pass! I did get an e-mail from the H & M customers service and they said they were sorry but sometimes the color turns out different than the picture. I do get that, but come on! There's a difference between the brown on the picture and the real color the shoes were. But since I'm keeping them, I should just be happy and enjoy them. After all, they were only 18,61 euros. A massive difference than the original price of 49,95 euros. Haha! I'm do the same with Buffy the Vampire Slayer. I have to marathon that show once a year! Oh I love them! Perfect for winter! Thank you. Will check your giveaway!